Thailand is the world's 51st-largest country by area, 20th-largest by population, and the 28th-largest in the world by economic size. With a newly industrialized emerging market economy, international investors know the country for its robust growth rates that are being driven by a rapidly expanding population and growing exports around the world. 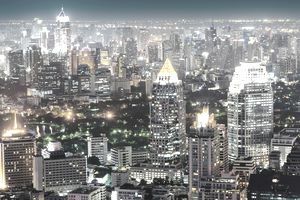 Thailand's economy is the second-largest in Southeast Asia (after Indonesia), but its per capita income is ranked fourth in the region, after Singapore, Brunei, and Malaysia. Gross domestic product or GDP growth has settled at around 4 percent to 5 percent per year as a long-term average, driven by strong auto industry and its status as a significant exporter of rice and agricultural commodities. After experiencing a setback with significant flooding, Thailand's economy had been recovering strongly since 2013, thanks to a higher minimum wage and infrastructure projects in areas devastated by flooding. The country's GDP contracted by 0.3 percent in 2015, but quickly recovered to 3.2 percent in 2016, and 3.9 percent in 2017. And, economists believe that the economy will grow by 4.2 percent in 2018. The country's political leadership has been under pressure since the military coup in 2014. With a new Constitution in place, the country's leadership hopes to move past these issues and rebuild the economy, although Western sources remain skeptical. The military government's latest "Thailand 4.0" initiative is designed to free the country from its middle-income trap and make it a high-income nation. The easiest way to invest in Thailand is using exchange-traded funds or ETFs, which offer instant diversification in the U.S. traded security. With nearly $500 million in total net assets, the iShares MSCI Thailand Capped ETF (NYSE: THD) represents the most popular option for U.S.-based investors to gain exposure to the Thai economy. The fund holds over 120 different securities weighted primarily in financials and energy, with its three largest holdings accounting for more than 20 percent of its portfolio. With an expense ratio of 0.62 percent, the ETF is cheaper than many actively managed mutual funds. Investors should look at the fund's equity beta, concentration risks, and other factors before adding it to a portfolio. Historically, international ETFs focused on emerging markets have had higher beta coefficients than domestic ETFs, which means that they may be riskier for investors. Investors looking for more direct exposure may want to consider purchasing American depository receipts or ADRs, which are U.S.-traded securities representing foreign equities like those in Thailand. While they aren't as diversified as ETFs, they represent a way for investors to purchase individual stocks to capitalize on more specific opportunities. Investors should keep in mind that ADRs may have less liquidity than their domestically-traded counterparts on foreign exchanges. While the many UK and European ADRs have a lot of volume, emerging market ADRs—like Thailand's ADRs—may have significantly greater liquidity risk. Investors may also have to build their portfolio of ADRs for well-rounded exposure, which can be challenging when dealing with emerging market companies. Thailand's economy faces some geopolitical risks that investors should carefully consider before placing any money. Compound these risks, the country's economy may face some risks of its own related to inflation and monetary policy. Failure to contain any of these risks could destabilize the country and present major potential problems. The country faces a high exposure to China's slowing economy, while the government is in a transitory phase of developing a new constitution. The government faces ongoing insurgency involving ethnic Malay Muslim rebels in the South, which threatens to destabilize the region, if left unresolved. Inflation remains a major concern given the economy's strong economic recovery, which could threaten consumer spending and political unity. Investors should carefully weigh these risks against the benefits of investing in Thailand before making any investment decision. In general, it's a good idea to add Thailand ETFs or ADRs as just one part of a diversified portfolio to maximize risk-adjusted returns over the long run. How to Invest in Africa, "The Final Frontier"